Years ago GOHOP went on a journey of exploration. We loved some of the spiritual DNA we had received from the International House of Prayer in Kansas City: praying scriptures, a vocational call for some to a lifestyle extravagantly given to prayer, the fusion of prayer and worship, the centrality of Jesus in the prayer movement. However, we found that the IHOP model wasn’t fitting us or our context the way we had hoped. It was like we borrowed a friend’s sweater that we loved, but our body was shaped differently, so when it was on us, it didn’t fit or look the same. We wanted our Presbyterian friends to be just as comfortable in the prayer room as our Pentecostal ones. Although we loved Harp and Bowl, we were eager to explore what the Apostle Paul calls “all kinds of prayer.” And we wanted to create an expression that was meaningful and accessible to the urban poor. Enter 24-7 Prayer and Andy Freeman. Andy was the founder of 24-7 International’s first Boiler Room (their name for Houses of Prayer) and co-authored a book Punk Monk with Pete Greig. In his book, Andy painted a picture of communities built around prayer, mission and justice, and models of doing life and prayer together that seemed like they might fit us better. So we began to knit our own sweater, keeping the wooly bits from IHOP that we still loved, and weaving in strands of spiritual DNA and models that Andy and 24-7 embodied. The end result? GOHOP in it’s present incarnation. Community dinners and houses. Prayer in UHauls in back alleys. A joyful mash up of all kinds folks from diverse theological perspectives. Today I’m picking Andy up at the airport, and he’s spending three days with us. We’re gonna show him around Hamilton and immerse him in our rhythms. In a sense, he is an important spiritual father to our little prayer community. I’m hoping that as he prays, eats, and chats with us, that he will see how God has used him to create life in our midst and help us knit a sweater that fits – that he would see his life and vision enfleshed in our community and that he would be encouraged. 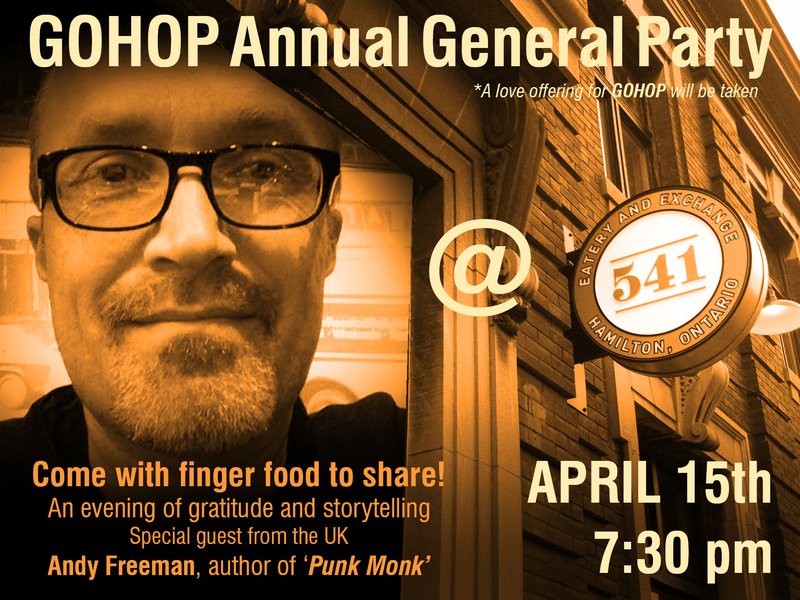 Andy will be joining us at our Annual General Party at 541 Eatery and Exchange on Wednesday night at 7:30. Once a year we gather to eat, pray, and love…. and tell stories. I bet Andy’s got a bunch of good ones. Maybe you can join us!